The HP Genuine 56 Blank Ink Cartridge is a moderate-capacity cartridge compatible with Deskjet, Officejet, PSC, and PhotoSmart printers, the HP Digital Copier 410, and HP Fax 1240. 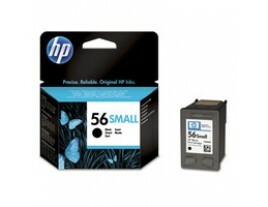 With genuine HP ink, the HP 56 Genuine Black ink C6656GE cartridge provides laser-sharp text. When used with cyan it produces 190 pages of no-smudge images every time. This cartridge is designed for those who do not use the printer every day but who need high-quality documents when they do. Even with long gaps between print jobs, the HP Genuine 56 Black Ink Cartridge performs consistently and creates attractive text and sharp lines. This cartridge is easy to install correctly, and the on-screen ink level monitor indicates when it's due for replacement. This cartridge is a logical choice for those with moderate printing needs.